Disclaimer: The embedded video may be disturbing for some viewers. 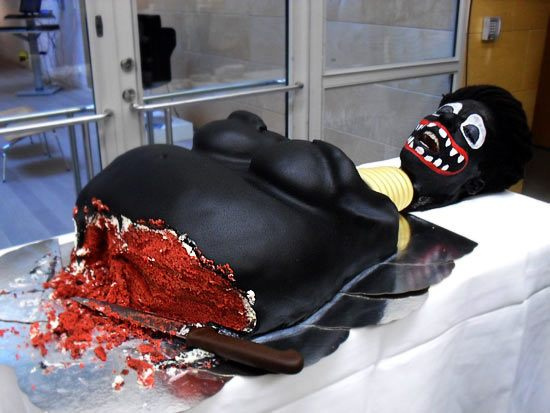 On April 15, artist Makode Linde‘s cake art, in the shape of a naked black woman [update: I read that the cake was modeled after Sarah “Saartjie” Baartman], was meant to highlight female genital mutilation (FGM) on World Art Day in Sweden. I have been struggling to write about this for days because each time I see the video or images I am infuriated. I understand that art can do that. Art can challenge. Art can inspire. Art can make you question your perspectives. Art can even make you sick. That being said, FGM is a very serious issue. FGM is recognized internationally as a violation of the human rights of girls and women. According to the World Health Organization, about 140 million girls and women worldwide are living with the consequences of FGM. In Africa, about 92 million girls age 10 years and above are estimated to have undergone FGM. The image of a female cake, a red cake, being cut into is challenging to watch. Linde’s blackface persona screaming as the knife cuts into the cake creates an even more difficult, uncomfortable and controversial experience. Personally, the smiling inquisitive faces of those in attendance is puzzling but is not where I find the most frustration. When did this performance piece get out of hand? The moment Lena Adelsohn Liljeroth, the Swedish Minister of Culture, fed Linde a piece of cake. There’s much dialogue around racism and the appearance of a black woman in agony surrounded by the white elite – I can see that. I can see how Linde is challenging the viewer. I get it. The cutting of the cake partnered with Linde’s cries make me uncomfortable, but isn’t that the point? What I cannot fathom is the momentary lack of judgement by Linde and Liljeroth. The simple exchange of cake undermines the intent of the performance piece and makes a mockery of FGM and the plight of millions of young girls and women. Tags: female genital mutilation, Lena Adelsohn Liljeroth, Makode Linde, Sarah "Saartjie" Baartman, Sweden, World Art Day, World Health Organization. Bookmark the permalink. Jamie, I completely agree. Like or dislike the performance art, agree or disagree with the concept, but respect the integrity of the issue by maintaining the separation of artist and audience. Laughing, smiling attendees clearly illustrate that the air of the experience has turned from circumspect to circus. Gross. I concur. Given the reaction of the cutters, if the artist was attempting a statement about racism, he was quite successful in so doing. I do not want to take a holier than thou position, but I can not imagine being in the same room where this was going on. My reaction might be different if the smiling and laughing folks were confronted for their actions. What kind of statement would it make if upon cutting, the cutters stopped in horror, or at least showed some bit of reflection on their actions. From the video attached, it seems that the attendees are mostly concerned about getting their cake, and eating it to. Revolting.